I've been to Hop Sing three (maybe more) times through the years and gradually grew to like it as a nice quiet place for good homely meals. Hop Sing is a simple little Cantonese restaurant tucked away in Ponderosa Golf and Country Club in Johor Bahru (near Taman Molek). 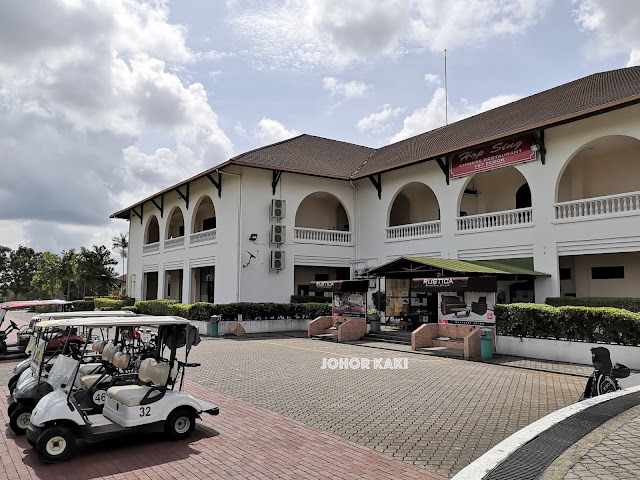 Hop Sing restaurant is located at level 1 of Ponderosa GCC's main club house. Hop Sing Head Chef Lean Poh Leong who hailed from Ipoh worked his way up in Ponderosa GCC for nearly 2 decades to reach the top position in Hop Sing today. 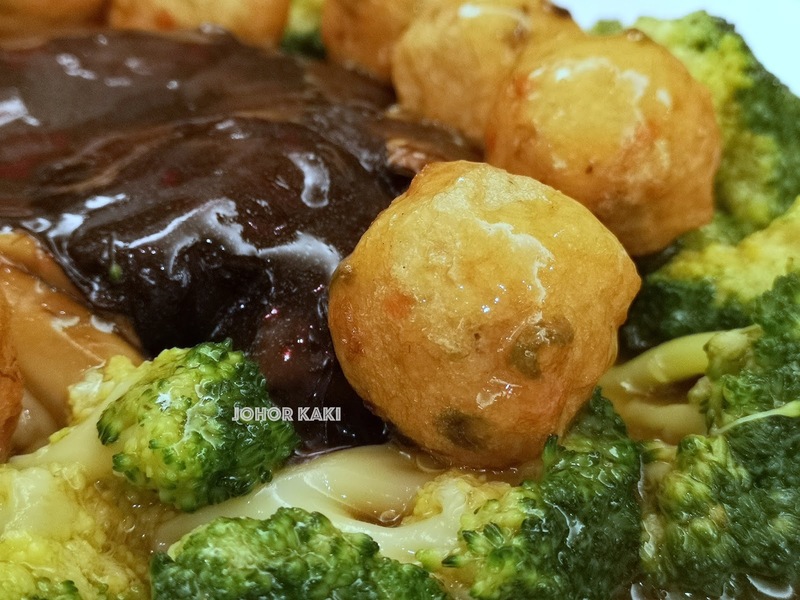 A Hakka, Chef Leong added Hakka home cooking touches to Hop Sing's classic Cantonese menu. 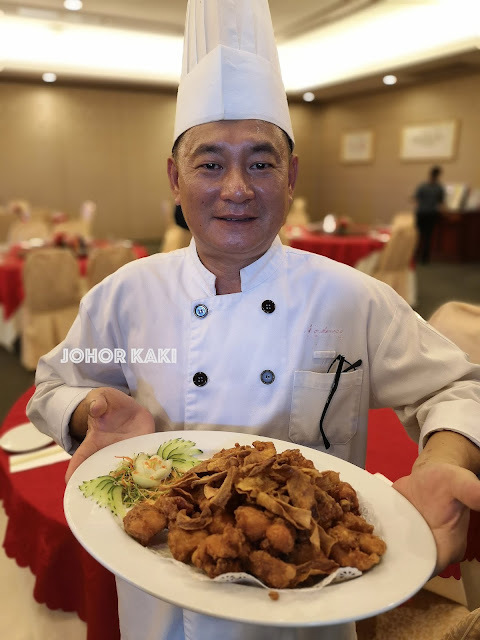 Good examples are his Deep Fried Ginger Chicken and Hakka Braised Duck with Ginger. 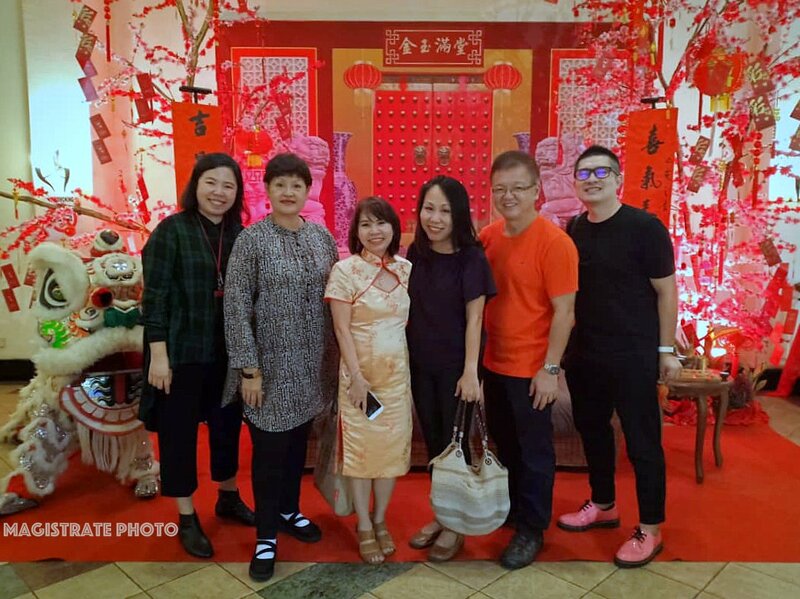 For this post, I shall focus on Hop Sing's Chinese New Year offerings, namely the Fortune Set Menu (8-10 pax RM998+) and Prosperity Set Menu (8-10 pax RM1388+). We had the Fortune Set Menu. The whole atmosphere at the Ponderosa GCC clubhouse was thick with Chinese New Year festive mood. Monkeying around as the sand worm in the Journey to the West. Some fun before we settled down for dinner. Hop Sing too was dressed up for Chinese New Year. 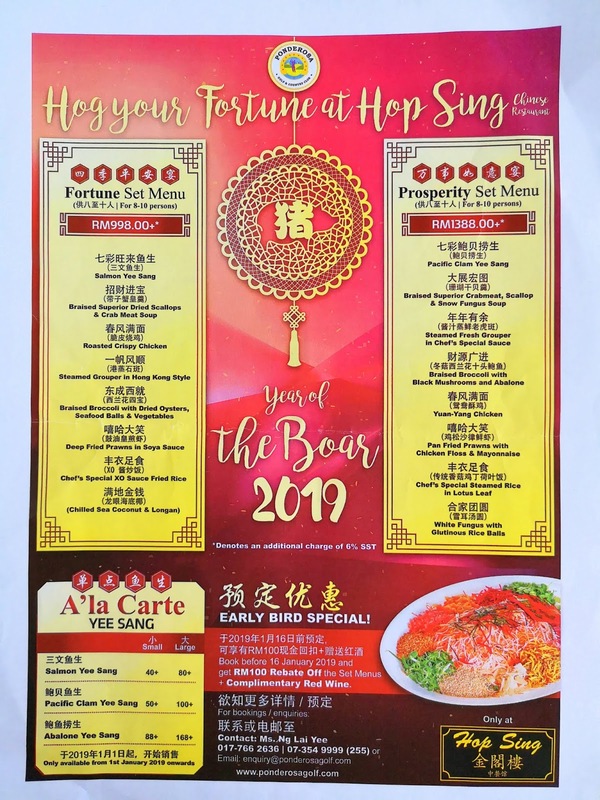 The Chinese New Year set menu dishes were auspiciously named for well wishes in the year ahead. 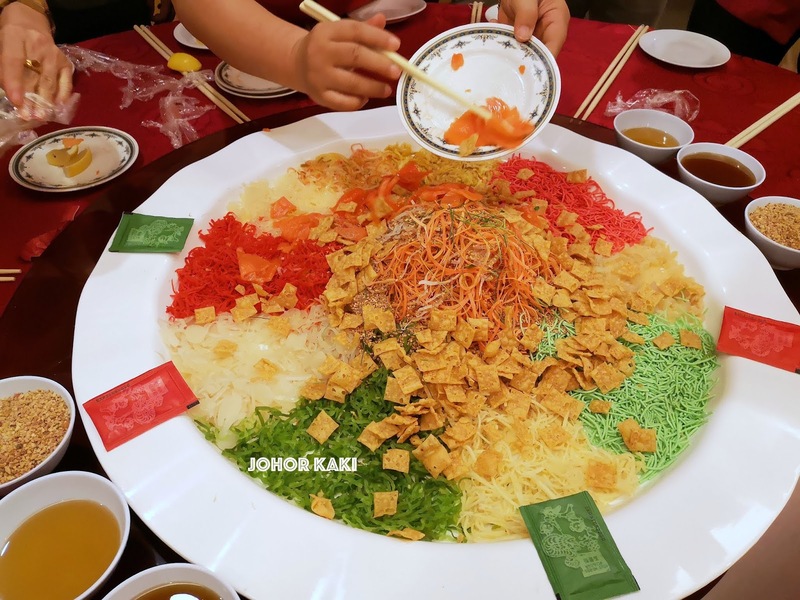 We started with the customary joyous loh hei yee sang 七彩旺来鱼生 to put us in the celebratory mood. The communal dish symbolises good fortune in the year ahead. 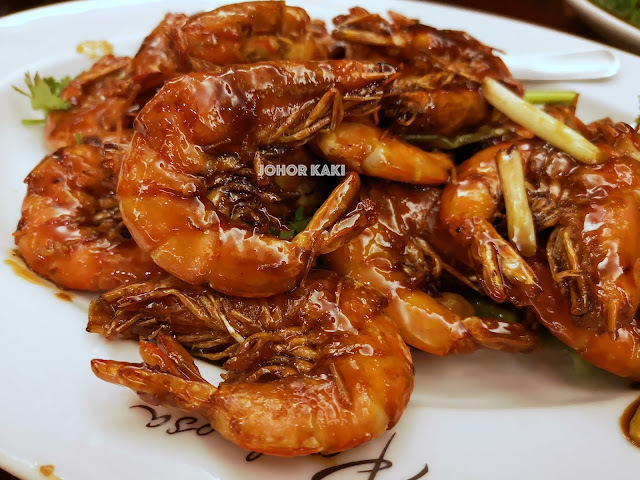 Every ingredient in the yee sang is specially chosen for its auspicious symbolic significance. 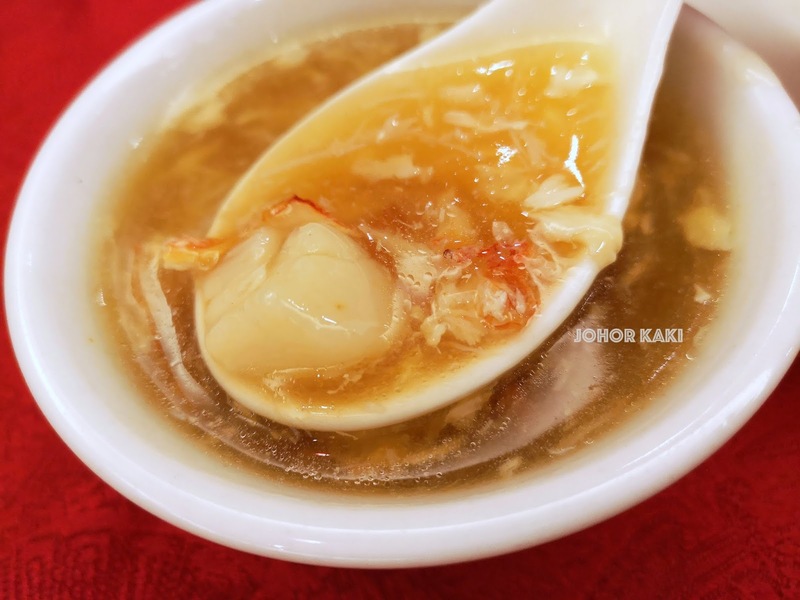 Braised Superior Dried Scallop and Crab Meat Soup. 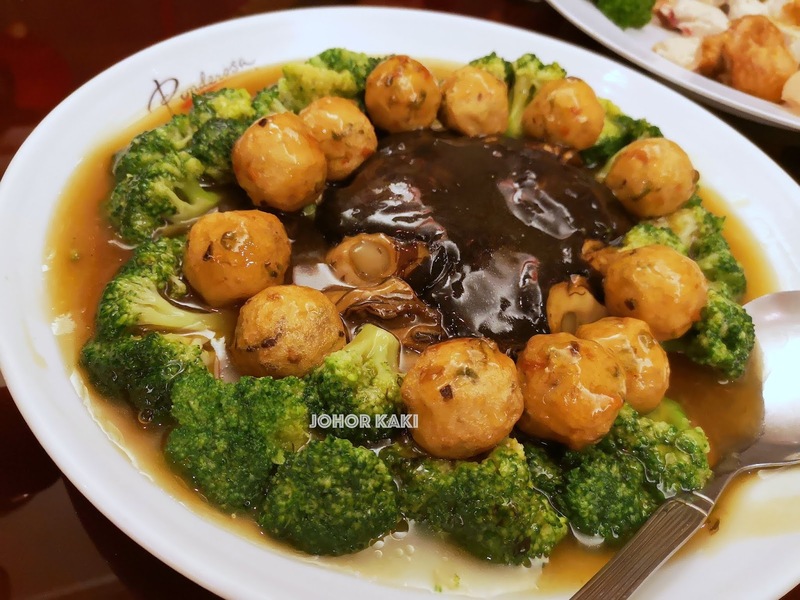 This dish named 招财进宝 means "attract and receive wealth and good fortune". 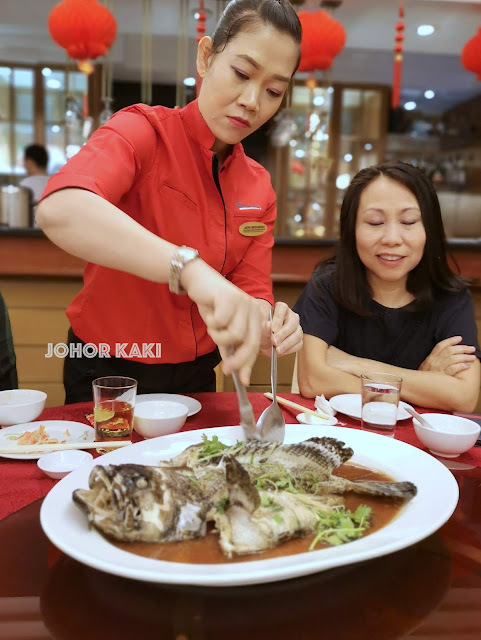 I heard it mentioned at the table that there was no shark fin used in the soup. Personally, I feel there is no need for any apology for the omission as the soup tasted great in its own right. 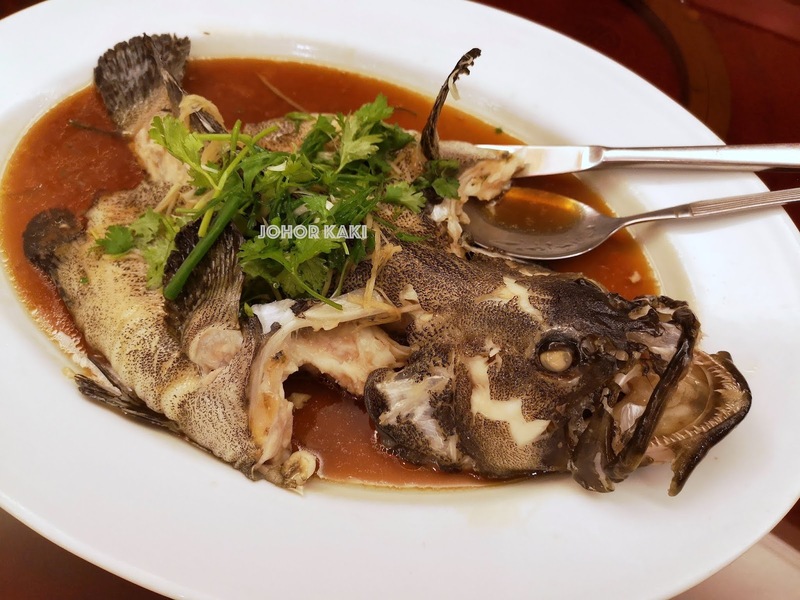 Steamed Grouper in Hong Kong Style. 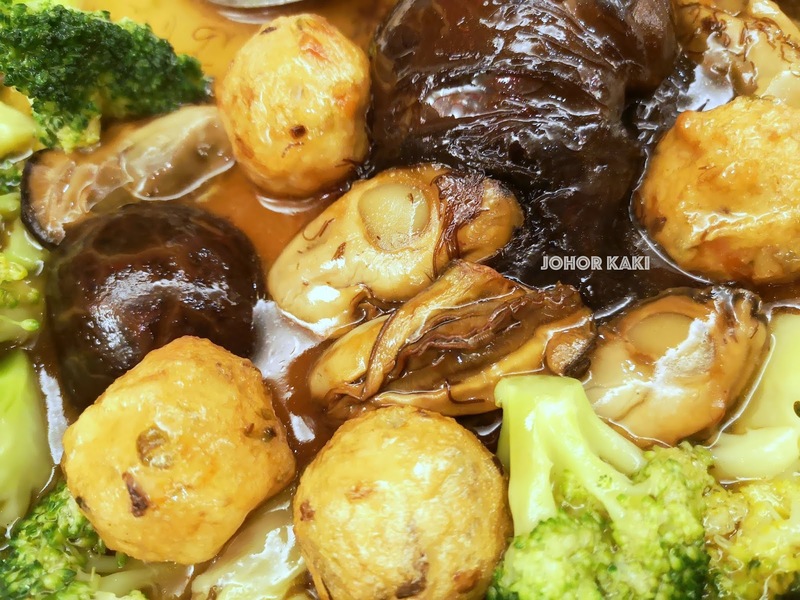 This dish named 一帆风顺 which means "smooth sailing". 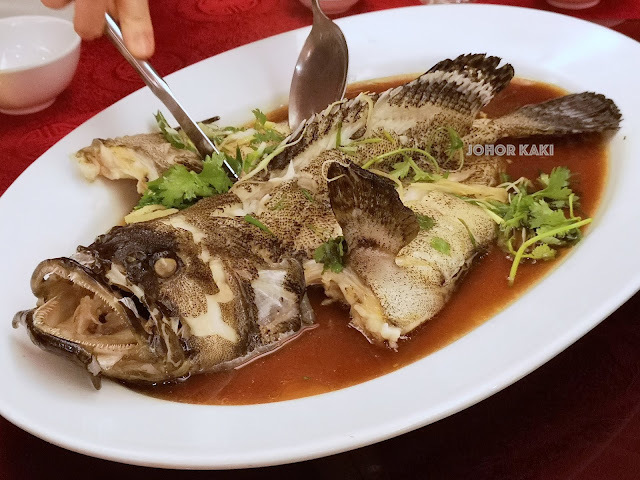 Standard fare in Cantonese restaurants and Hop Sing's rendition did justice to the fish and the dish. The soya sauce based dressing sauce had just the right savouriness to bring out the natural sweetness of the fish. The tender juicy flesh was done just right so we can taste the freshness of the fish (even though it wasn't a live fish). The staff portioned and served us the dishes individually which I always appreciate. Roasted Crispy Chicken. 春风满面 "Filled with the freshness and energy of Spring". This was the dish I looked forward to at wedding banquets as a child. Hop Sing's rendition of this old school stalwart reminded me of the savoury flavours with tender and crisp mouthfeel that evoked the magic of those years. 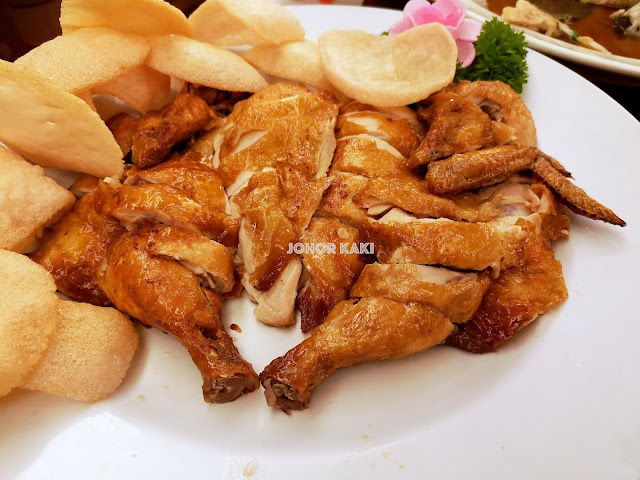 The roast chicken was served with a customary small dish of salt but I didn't use it at all as I like the taste of Hop Sing's roasted crispy chicken as it was. Braised Broccoli with Dried Oysters, Seafood Balls and Vegetables. 东成西就 "Success in all directions". Everything in this dish was tasty. The fish and squid in the house made seafood balls gave it a nice springy bite and layers of savoury sweet flavours. There was a generous amount of good size stewed Chinese black mushrooms and robustly savoury dried oysters. Everything was nicely held today with a thick savoury brown sauce. 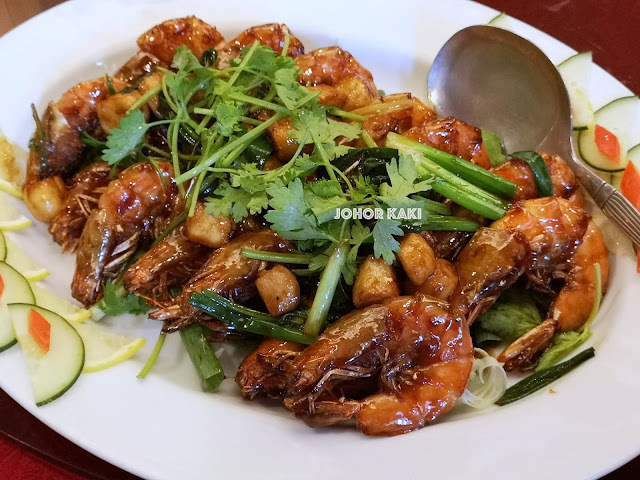 Deep Fried Prawns in Soya Sauce. This traditional dish named 嘻哈大笑 which means "Joyous laughter". Old school savoury har lok 虾碌 worth getting our fingers and manicure greasy for. Chef's Special XO Sauce Fried Rice. 丰衣足食 "Well clothed and well fed". Looked ordinary but this fried rice packed a nice well balanced savoury sweet punch. 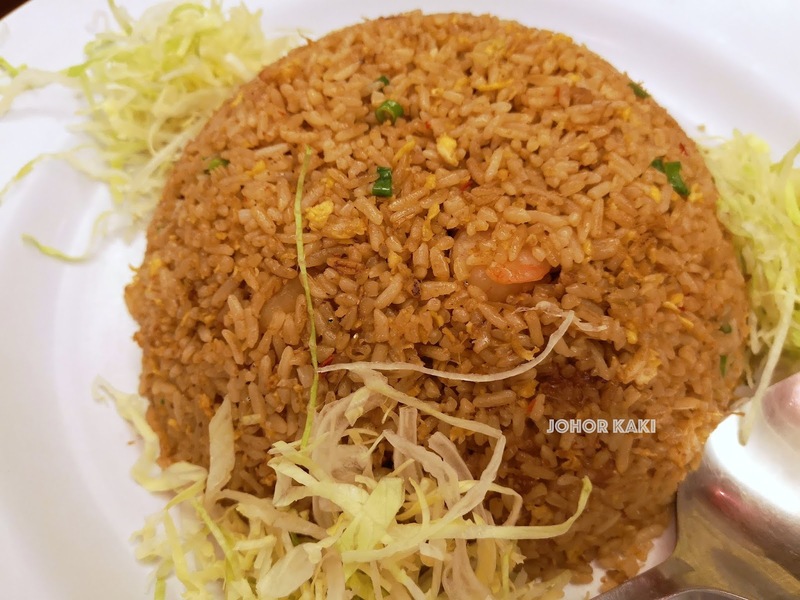 The most striking thing was the rice's tender spring to the bite. This fried rice was deceptively addictive and one can unknowingly overindulge. This Peanut Paste 花生糊 dessert wasn't part of the Fortune Set Menu (the standard menu dessert was Chilled Sea Coconut and Longan). But, our dear host Yvonne knew all of us were crazy over Chef Leong's peanut paste so she swapped the dessert for us. 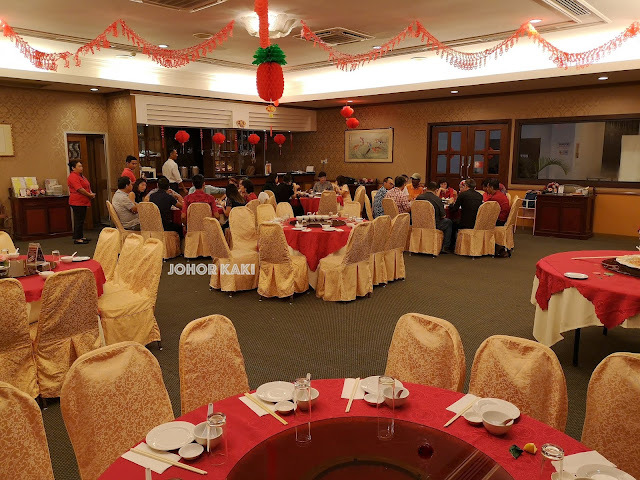 Information for you 👉 Hop Sing restaurant at Ponderosa Golf & Country Club is worth considering for your Chinese New Year celebration gatherings. 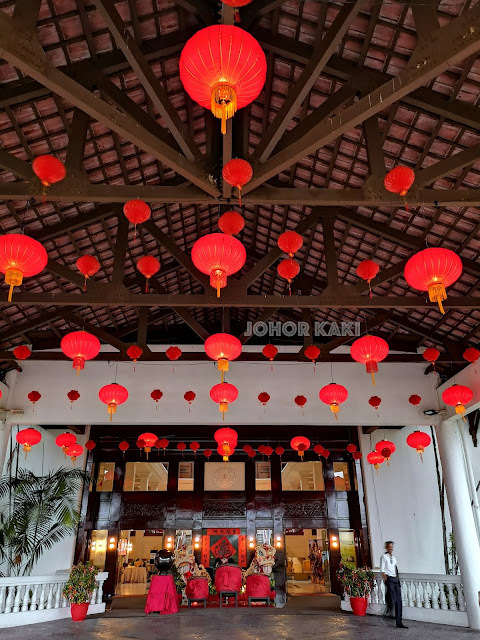 The clubhouse is well dressed up for the CNY mood. Hop Sing's Chinese New Year dishes are tasty and filled with auspicious meaning and well wishes. 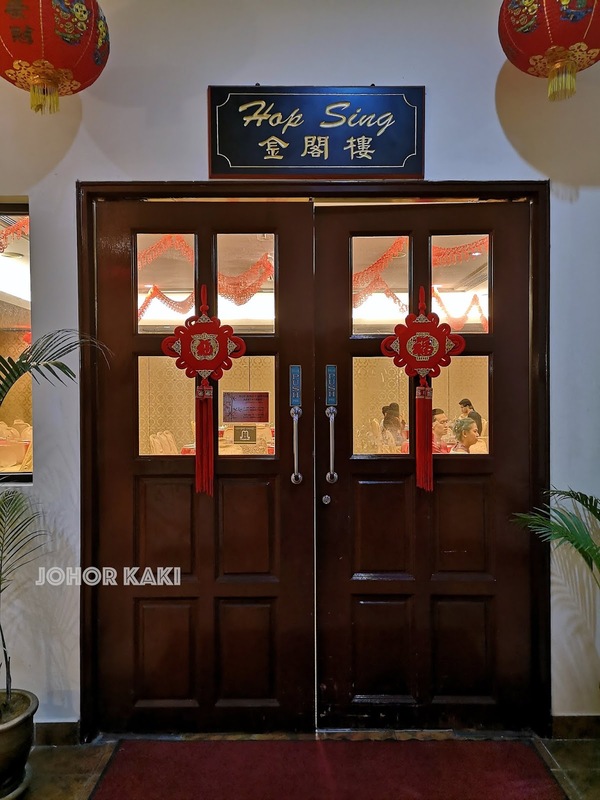 Fun fact: Hop Sing restaurant is named after the character Cantonese Chef Hop Sing in the TV series Bonanza. The Bonanza series had 431 episodes running from 1959 to 1973. Many parts of Ponderosa Golf and Country Club are named after places in the TV show. Indeed, Ponderosa is the name of the ranch in Bonanza. Victor Sen Yung, the actor who played Hop Sing in Bonanza was an accomplished cook and published a cookbook of his wok dishes in 1974.